Testing shows MSI's M.2 shield traps heat. 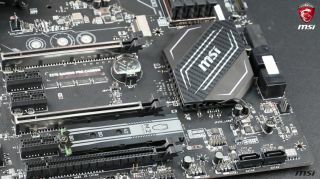 MSI developed what it thought was a clever solution to prevent M.2 solid state drives from throttling due to overheating. The M.2 shield, as MSI calls it, is a piece of aluminum with a thinly sliced thermal pad on the underside that covers the motherboard's M.2 2280 slot. It's supposed to dissipate heat and lower temps of the SSD, but testing shows it can have the exact opposite effect. Our friends at GamersNexus attached temperature sensors to a HyperX Predator M.2 SSD installed in MSI's Z270 Gaming Pro Carbon motherboard and recorded idle and load temps. What they found is that the M.2 shield was able to lower temps on the NAND flash memory chips on top of the SSD by 1-2 degrees, but caused the chips on the underside of the SSD to rise by around 4 degrees. The SSD's controller and its internal sensor placed by Kingston also showed higher temps with the M.2 shield installed, rising about 4C at idle and 4-5C under load. MSI had the right idea in wanting to lower SSD temps, unfortunately its M.2 shield doesn't seem to do a sufficient job, at least not all around. The design is flawed, assuming GamerNexus didn't goof in its testing (we haven't had a chance to test this ourselves). By covering the SSD with a shield, warm air gets trapped on the underside where the chips don't make contact with any metal. The good news here is that the M.2 shield is an optional accessory—it's installation isn't required to use use an M.2 SSD in a motherboard that ships with a shield. It's also worth noting that load testing consisted of intense writing in IOMeter for 60 minutes. That is an extreme scenario that few people will ever find themselves duplicating in the real world, and even then, a 4C temp increase isn't necessarily disastrous. On the flip side, testing was performed using an open-air test bed. The results could actually be worse inside a case, depending on airflow. So what's the bottom line? It's probably best not to use the M.2 shield, especially if you plan on doing any intense data transfers.